Paris: Update at 2.53pm: At least 10 people died and 30 were injured in an overnight blaze at an apartment block in Paris that police are treating as possible arson, officials said Tuesday. The fire on the upper floors of the building in the rue Erlanger in the upmarket 16th district of southwest Paris is the most deadly in the capital since 2005. Videos from the scene showed flames leaping out of top floor windows and firemen climbing flimsy ladders to rescue terrified residents, some dressed only in pyjamas, from the top of the eight-storey block. Described by one rescue worker as a "scene of incredible violence", the blaze left around 30 people - including six firefighters - injured and at least 10 people have died, the fire service said. An investigation has been opened into the criminal charge of causing death by arson amid fears that the toll could climb further. A woman has been arrested over a deadly blaze that killed eight people in Paris and police are treating the fire as a possible arson attack, a prosecutor said Tuesday. Speaking at the scene, Paris prosecutor Remy Heitz said that a woman who lived in the building in rue Erlanger in the wealthy 16th district had been detained by police. "One person has been arrested. It's a woman. She's currently in custody," Heitz said. Eight people have died in an overnight blaze at an apartment block in Paris that is being treated by police as possible arson attack, officials said on Tuesday. 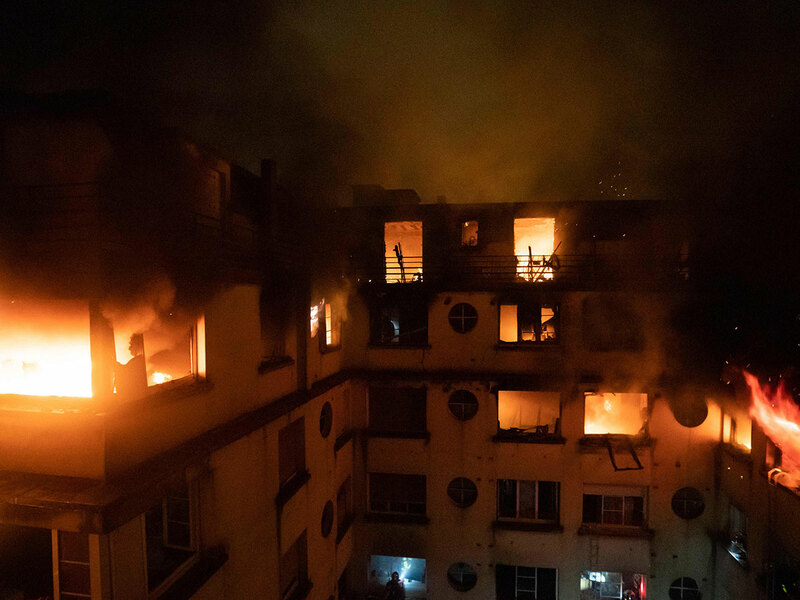 The fire on the top floors of an eight-storey building in the rue Erlanger in the wealthy 16th district of southwest Paris is one of the most deadly in the capital in years. Pictures from the fire brigade showed flames leaping out of top floor windows and firemen climbing ladders to rescue terrified residents from thick black smoke. Described as a "scene of incredible violence", the blaze left around 30 people - including six firefighters - with injuries. The fire started at about 1am (0000 GMT) and was finally brought under control more than five hours later by around 200 firefighters. Fire service spokesman Captain Clement Cognon told AFP at the scene overnight that "the toll could still increase" because firefighters were yet to search the upper floors of the eight-storey block, "where the fire was the most violent". Some of those affected scrambled on to nearby roofs to escape the smoke and flames. The residential neighbourhood lies on the edge of the vast Bois de Boulogne park and close to the stadium of football club Paris Saint-Germain, the Parc des Princes. Captain Cognon added: "We had to carry out many rescues, notably for around a dozen people who had taken refuge on the roofs. In total about 50 people were evacuated by firefighters, including through the installation of ladders." Two adjacent buildings were also evacuated as a precaution and local officials were on site to help find housing for residents who could not return to their homes. Several streets were cordoned off by police and fire crews, and an AFP journalist said a strong smell of smoke hung in the air. The blaze follows a fire caused by a powerful gas explosion last month that killed four people in the city's central 9th arrondissement.